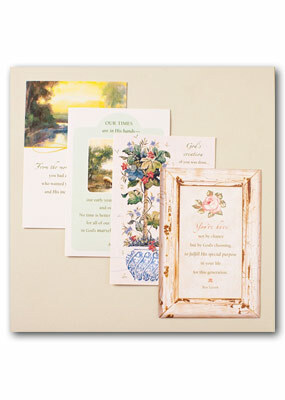 Folded card size: 4 ½" x 6 ½"
our times are in His hands - our early years, our middle years, and our later years. No time is better or greater than another, for all of our years work together in God's marvelous plan for our lives. In expectation of what God has ahead for you and with a prayer that His blessing will be upon all you do. You're here not by chance but by God's choosing, to fulfill His special purpose in your life for this generation. As you celebrate your birthday, may you carry a deep sense of God's hand upon you and His special purpose for your life. with the heart of a Father. In celebration of you - His wonderful creation. and, behold, it was very good. From the moment your life began, you had a Father in heaven who wanted you to know His hear and His incredible love for you. In the coming year may you daily discover the depth of His heart and the measure of His love for you. the Father hath bestowed upon us. 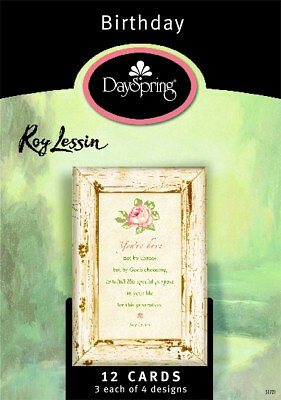 Birthday Box: Roy Lessin was published by Dayspring in July 2017 and is our 1569th best seller. The ISBN for Birthday Box: Roy Lessin is 081983384646. Be the first to review Birthday Box: Roy Lessin! Got a question? No problem! Just click here to ask us about Birthday Box: Roy Lessin.